As someone who has given some speeches, I suspect that you feel pretty comfortable writing your speeches. You may not like doing it (who does? ), but when the time comes to get it done you sit down and take care of it. That’s all well and good, but what would you do if someone who understands the importance of public speaking asked you to write a speech for them? All of a sudden the speech that you’ll be creating is not your own – it will be spoken by someone else. How are you going to go about doing this? What Does It Take To Write A Speech For Someone Else? By now, you probably know what it take for you to be able to write a speech that you’ll end up giving. You know what kinds of inputs you’ll need and you know how you’ll go about turning them into the stories that you’ll work into your next speech. However, when it comes time to create a speech for someone else, this all gets mixed up. The way that you go about building a speech for yourself is very personal and it may not work when you’ve been asked to create a speech for someone else. When you are going to be creating a speech for someone else, you need two things. The first is an ear for a story. The second is an eye for detail. What this means is that as you start to prepare to create a speech for someone else, you may find yourself talking with them for a very long time in order to collect the information that you are going to need to create a relatively short speech. In order to get the information that you’ll need to create the stores that will make a speech memorable, you’ll need to cover a wide range of topics with the person that you’ll be writing the speech for. These can include such topics as their childhood memories and what their current hobbies are. You will additionally need to spend your personal time reading as much as you possibly can. It’s only by doing this that you’ll be able to get the random anecdotes that will fill out a speech. When we are writing for ourselves, we sorta have all of the time in the world. That’s not really true, but since we are in charge of our own time, we know when we’ll be giving the speech and we can get around to writing the speech sometime before we’ll be on the hook to give it. This all changes when you are writing for someone else. You need to get their speech done and to them in plenty of time so that they can review it, make edits, and then you can change it. This means that you are going to have to get good at writing speeches very fast. Another big change that you’ll have to deal with is that you are going to have to make the first draft of any speech that you write count. When we are writing for ourselves, we can knock out a first draft that is missing big pieces and is put together poorly because we know that it’s a first draft. However, when we are writing for other people there will be times that they’ll just grab our first draft and then go deliver it. This means that it’s got to be right the first time. 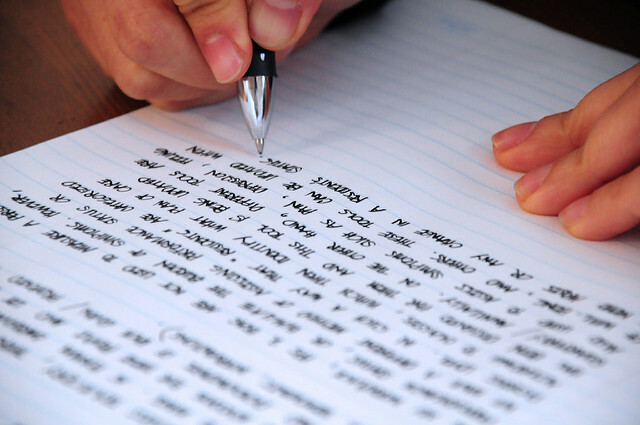 When writing a speech for someone else, you need to be very careful to put your own thoughts and feelings aside. What this means is that you need to remember that this is not a speech that you’ll be giving. Instead, you are trying to write it so that when the other person delivers it, it will sound natural coming from them and they’ll be able to share the benefits of public speaking with their audience. The speech that you create is going to have to reflect the things that they believe. I think that we can all agree that writing a speech is neither fun nor easy. However, by this time in your speaking career you’ve probably done it a few times and so you feel comfortable with the process. This can all get changed around on you if and when someone comes along and asks you to create a speech for them. When you are creating a speech that someone else will be delivering you are going to need to bring two things to the table: an ear for a good story and an eye for detail. In order to collect the information that you’ll need in order to create a good speech you’ll have to spend a great deal of time talking with the person that you’ll be writing it for. Additionally, you’ll need to be doing a lot of reading in order to collect background information. Time becomes critical when you are writing a speech for someone else – you need to get the speech done quickly so that they can review it. The first draft counts – this may be the one that they end up using. Finally, you need to make sure to work their voice into the speech since they’ll be the ones giving it. Being asked to create a speech for someone else is a great honor. However, since creating a speech is such a personal process, it can be very difficult to adjust how you create a speech for yourself and transform it into a process that works when you are creating a speech for someone else. Understand what the differences are and you’ll be able to deliver a speech that will end up making them sound great! Question For You: When do you think you should have a first draft delivered to a person that you are writing a speech for?